“Birds are the best signs of a healthy environment” says Lakshman Singh. Laporia has hundreds of thousands trees. Varieties of birds flock Laporia. Each house hangs a broken pot and keep water for the birds. The broken bund (mud embankment) was emblematic of all that was wrong with Lapodia. 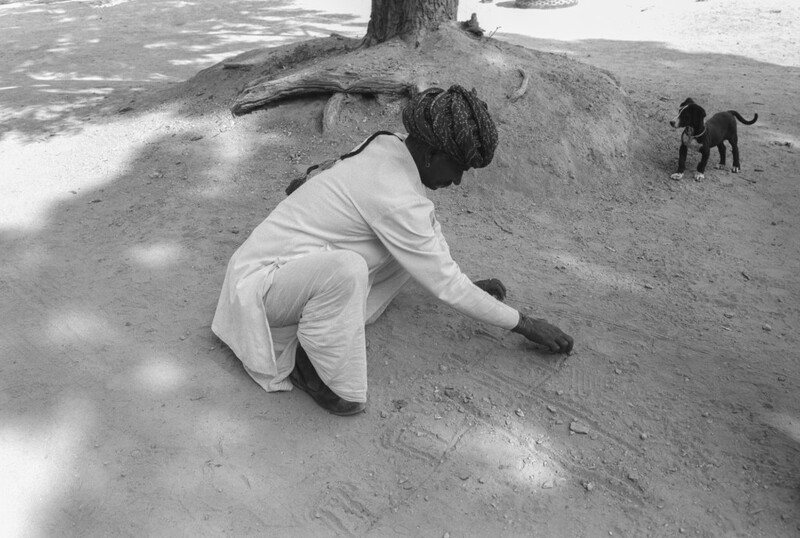 The inhabitants of this arid village in an arid district in India’s most arid state, Rajasthan, were dirt poor. They were malnourished, wore torn clothes and rarely washed. Soap, they could not afford. Nor sugar or milk in their tea. Many went to bed hungry every night. Diseases and illnesses went untreated, because there were no medicines. Children remained illiterate. Cattle died of thirst. Upper and lower castes rioted. Village toughs bullied. Families quarreled over crumbling property, dragging relatives to court. The root cause of Lapodia’s misery was acute water scarcity. 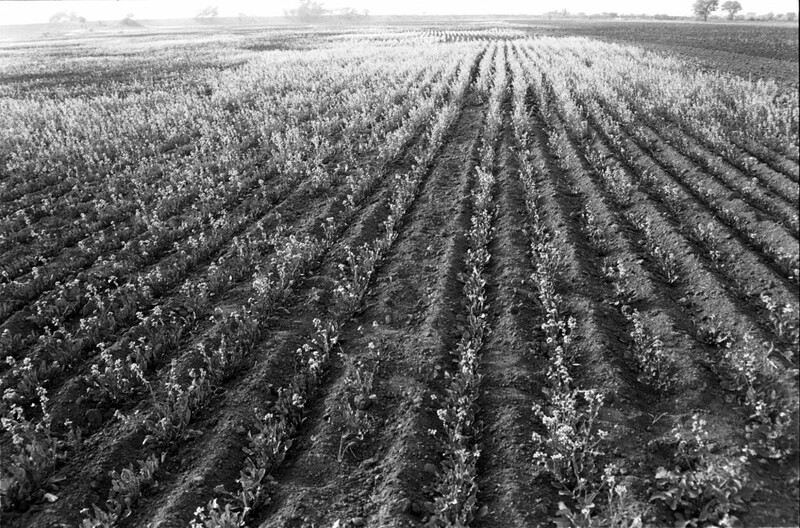 Farming was the main occupation for the 200 families. But drought, compounded by the crumbling bund, dry ponds and empty wells doomed cultivation to a perennial losing battle with nature. City jobs became the sole meal ticket. Laxman Singh went to Jaipur to study, but dropped out of school because his family could not afford the fees. Miserable, he returned to the misery of his village. He faced a bleak future. No education meant no jobs in the city. No water meant no farming in his village. Laxman Singh was 18 years old when he realized the only way to turn Lapodia’s misfortune was to repair the bund along the dry pond. It had remained broken for 30 years. If the scanty rainfall could be collected in the pond, then feeder canals could be dug to irrigate the fields, making cultivation feasible. Lapodia could turn “green”. Villagers mocked his fantasy. “And who would pay our wages to repair the bund?” they demanded sarcastically. Laxman Singh had no answer. He was stumped: no rich landlords to subsidize the labour; no philanthropists nearby to fund them and the government was far away and unconcerned. He was thoroughly depressed. There seemed no way out of this vicious cycle. Then one day it struck him perhaps there is a way out: villagers could volunteer to repair the bund. After all, they were the beneficiaries. Neighbours scoffed at his suggestion. They had better things to do. So Singh resolved to do it himself. One friend supported him. The pair decided to repair the bund themselves. It was no small task: the bund was 1.5 kms long and 15 feet high. Armed with spades, they set off to the bund one summer day in 1978. Passersby wondered: “How can the bund be repaired by just two people?” Singh retorted “Well, you can join us, that would help”. Four village youths joined him. By the seventh day, the trickle swelled to 20. When rains came two months later, water collected in the pond for the first time in decades. 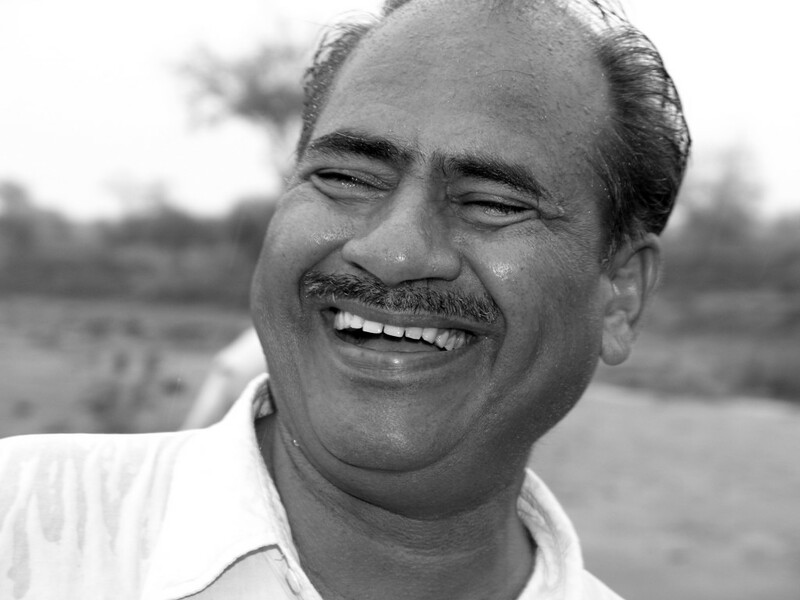 Laxman Singh also devised a simple but unique water harvesting program in the outskirts of his village. He calls it the “Chauka” system. It comprises a series of channels and square pits fringed by two-feet high bunds in a chequer board pattern over a five km expanse in which rain water collects and meanders down the natural slope of the land. This not only enables the water to flow into the ponds nearby, but creates grassy patches on the pits on which cattle can graze. Thus, the dry wastelands bordering the villages were converted into grassy village common lands, ideal for pasture. 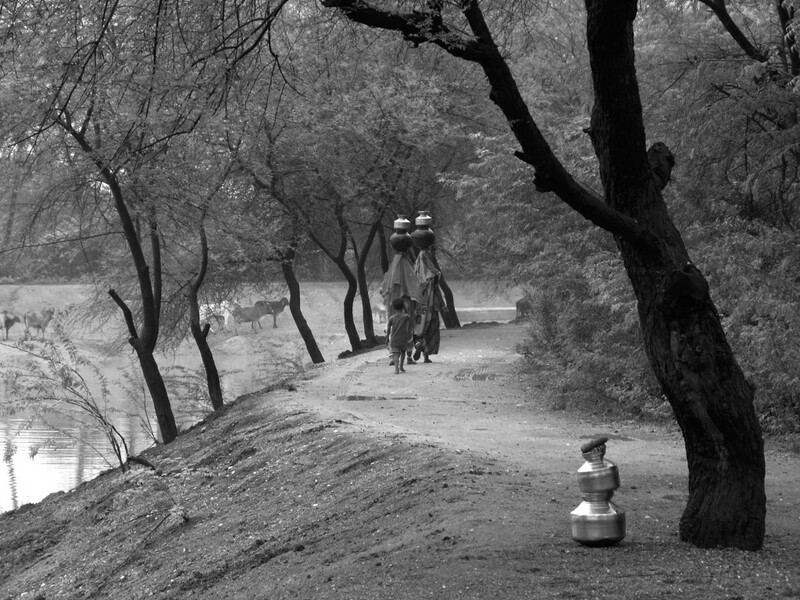 Over the years, all the ponds of the village were rehabilitated. Villagers performed puja to celebrate the consecration of “Dev Sagar” and “Phool Sagar.” Crops were harvested twice a year. Lapodia became virtually self sufficient as farmers grew corn, maize, bajra, jowar, wheat, lentils, groundnuts, chillis, mustard, fenugreek and a variety of vegetables. Their new-found sense of well-being made villagers feel the need to organize a thanksgiving ceremony. In 1987, the villagers institutionalized their annual nature-worshipping ritual. Villagers gather to renew their bond with nature and each other, eat gud, tie sacred threads and apply tilak on trees, birds, cattle, wells and ponds. They pray to Lord Indra to bless the village with rain. They tie rakhi on each other as a mark of friendship and community bonding. It is a day of festivity and rejoicing. Village development committees now decide on new programs to build roads, install taps, establish health and education facilities. Self-help for self-sufficiency is the village mantra; Panchayati Raj as Mahatma Gandhi envisioned. “Villagers must be encouraged to become custodians of their village and its surroundings. If every village becomes a viable, harmonious and peaceful economic unit, then people would be happy and India would be strong. When village life breaks down, and youngsters are forced to migrate in search of work, then villages starve and cities bloat. Both will die. It’s not sustainable,” predicts Singh, who has never heard of the pro-environment Norwegian Prime Minister, Gro Harlem Brundtland, who coined the phrase “Sustainable Development” in the 1980s. Singh typifies the Indian villager, who blessed with robust common sense, needs no celebrity endorsements or academic studies, to convince him of the ancient wisdom that he carries in his genes, refreshed everyday by observing nature. One would have expected Singh to be rewarded with a bouquet of citations for path-breaking work. Instead, village officials were displeased. They served him with a ‘show cause’ notice for usurping their authority. Laxman Singh had framed new rules for his village. If a villager cut one tree, he would have to plant five saplings as compensation. If he hunted animals, he must pay a fine of 11 bushels of grain. If he shot a bird, he would have to feed the village birds. Most complied; some complained. Local officials were annoyed. Punishing villagers was their job, not his. Laxman Singh was summoned to their office, but his entreaties and explanations that patwaris ignored such offences or took bribes from the offenders and released them, fell on deaf ears. When he heard about this harassment, a botanist from Jaipur, who had taken an interest in Lapodia’s transformation, contacted Delhi-based scientists, who in turn urged village officials to lay off Laxman Singh. They did. Slowly, the brickbats turned to bouquets as the authorities began to reward him with prizes for his pioneering work to rejuvenate Lapodia. Perhaps, the most remarkable aspect about Lapodia’s renewal is it’s afforestation that has lured birds. Says Laxman Singh proudly: “Birds are the best signs of a healthy environment”. Varieties of birds now flock to Lapodia. The village courtyard is a daily Kumbh Mela of parrots. Peacocks perch on roof tops. Woodpeckers hug trees. Pigeons strut. Koels coo hauntingly. People of this once arid, godforsaken village greet each day with the birdsong of larks, warblers, nightingales and other winged minstrels of the forests. Lakshman Singh’s ingenious method of rain water harvesting has made Laporia, a small village near Jaipur drought proof and poverty free. Starting in his home village, Singh has spread the idea to over 200 other villages benefiting more than 350000 people. Lakshman Singh and his friends in Laporia used ‘Chauk’ method of ground water recharging. A series of bunds, channels and pits are dug over a 5Km stretch in a checker board like pattern, following the natural slope of land. 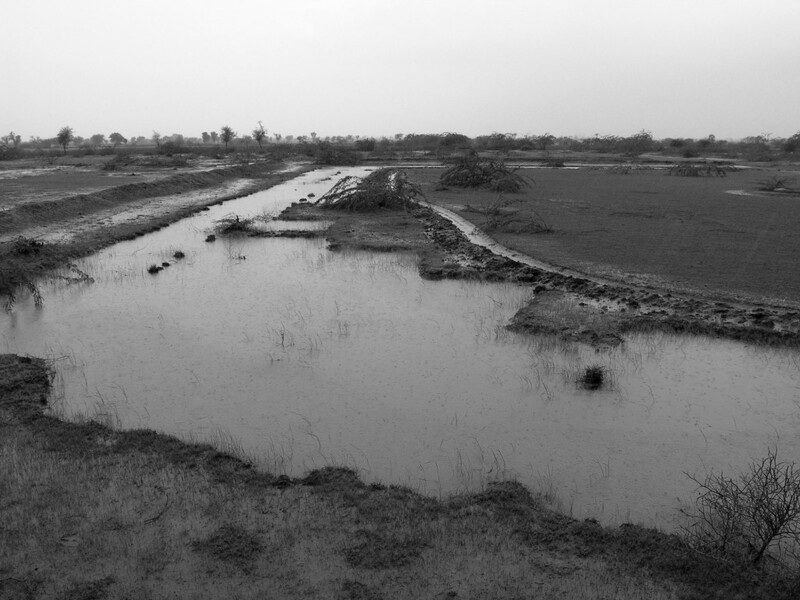 Rain water flows slowly across the Chauka system resulting in the retention of top soil and increase in moisture content. This also helps in recharging ground water. Oil seeds growing in Anna Sagar, the largest pond of Laporiya during winter when it dries up. This crop hardly need any water hence the dry lake bed is used to cultivate. Everyone practices organic farming in the village.